key features of a Gothic home. 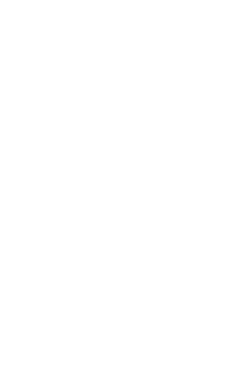 Joseph Taylor, a carpenter by trade, purchased two plots of land on Upper Street in Buckland in 1849 and began building the farmhouse he would call home. 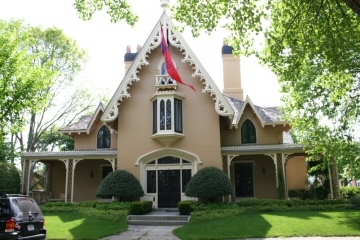 He chose to build it in the style of Gothic Revival, uncommon in New England at the time. Its origins here in the states is widely attributed to Maryland. It is known by other names and 'sub-styles' such as, Gingerbread, Romanesque, Queen Ann, etc... and tend to be quite ornate and decorative. However, in subdued, modest New England the reference is often said to be "Carpenter's Gothic." It is not clear if this was the first 'Gothic' home in the area but it was definitely the first on Upper Street. Three others would later be built and attributed to having been done by Taylor as well. after the reconstruction in 1936. 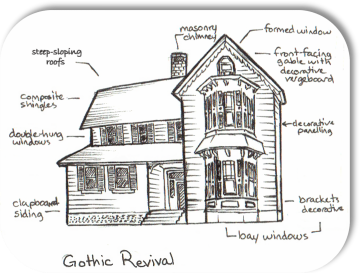 The diagram (upper left) illustrates the characteristics that makes Gothic Revival unique to that of its sibling Greek Revival. Foremost on the list is their front-facing gables, with decorative vergeboard, a formed window and steep sloping, composite (shakes) roofs. Then there is the double-hung windows, clapboard siding and masonry chimney. Also commonly featured are bay windows with decorative brackets and paneling. There is a bay window, original to the house and can be seen below (right). 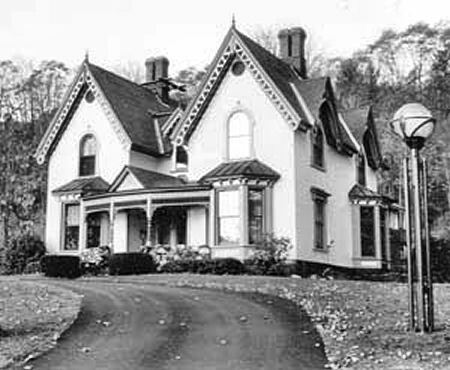 Woodward upon purchasing the home would need a first floor bedroom to accommodate his disability and had one built in the style and tradition of Gothic Revival featuring a bay window seen in the picture to the right. 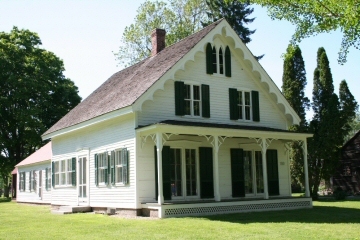 Below are pictures of the front-facing gable, vergeboard and formed window, as well as, the decorative paneling separating the roof eave and clapboard siding. 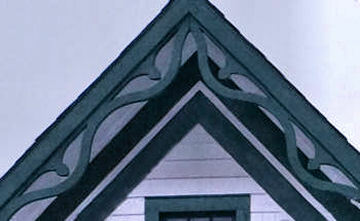 Next to that is a picture of the original pattern used to make the decorative vergeboard features of the gable. Ashfield. Above it, another small gable and formed windows. To the right is the bay window original to the house and to its right is a porch with another large window. This is by design, having large windows facing south is common in order to take advantage of the wintry sun which tracks east to west in a more southernly position during those months. Woodward was not the only owner of the property to hold true to its Gothic styling. 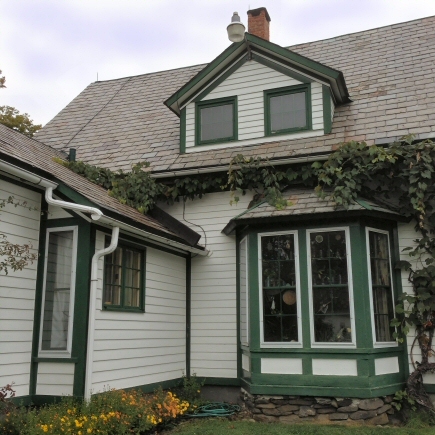 The carraige house (the red building in the picture at the top of the page) was added to the property by the property's namesake, Henry Southwick, in the early 1900's which also has a front facing gable and formed window. As the name suggest, this building was used to house horse carraiges and bugies much the way we would use a garage today. 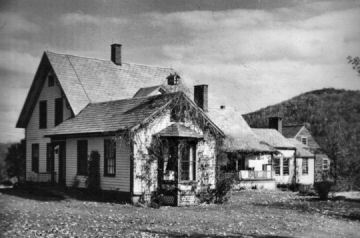 The carraige house was later converted to a 'country doctor's' office by Woodward beneficiary, Dr. Mark Purinton, which he practiced from for nearly 40 years.